Oh, I know I’m lactose intolerant….but…. We went out for ice cream last night. I’ve been eating healthy and losing weight…I DESERVED it. It was also a test to make sure that I was, in fact, lactose intolerant. 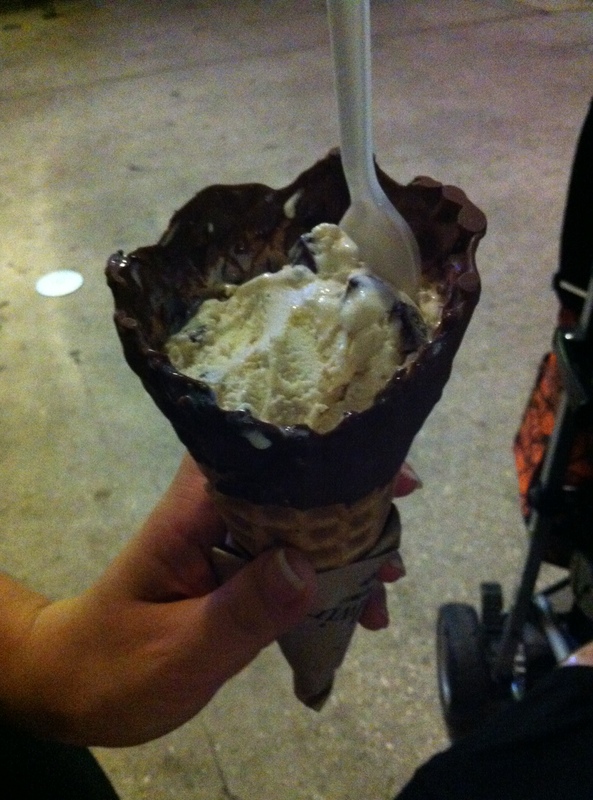 We went to Kilwin’s in Celebration and I had the salted caramel ice cream in a chocolate dipped cone. It was so delicious. The ice cream was so creamy and rich I needed a drink of water to wash it down!! The chocolate pieces, with caramel inside, were actually my favorite part. This is coming from a girl who picks any hard chocolate pieces out of most ice cream. Mr McDorkins had the toasted coconut ice cream in a waffle bowl. I always get a little weirded out by coconut, I guess because I associate the smell with sunblock. I did have a taste and it was surprisingly tastier than I thought it would be…It was very heavy in coconut and I loved the crunchiness it gave the ice cream. As much as I want to go back, I don’t think I want to relive the night long tossing and turning and the day of pain that follows. This entry was posted in Uncategorized and tagged caramel, celebration, disney, florida, ice cream, kilwin's, orlando, review, salted, yummy by themcdorkins. Bookmark the permalink.